Food plays a major role during my travels. I really enjoy my food, simple as that. And I look forward, each and every day, to the meals that await me wherever I may be. 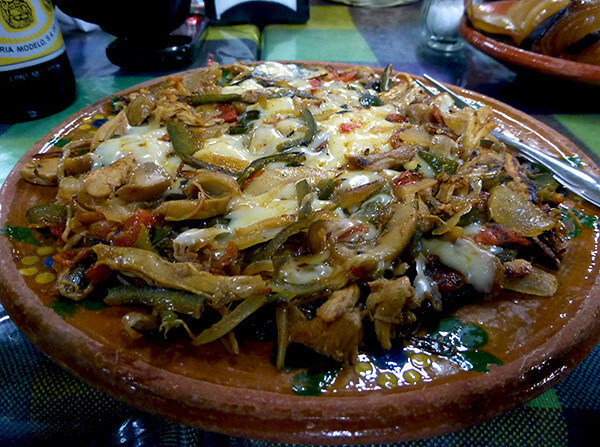 During my recent trip to Mexico, the situation was no different, especially considering how fond I am of the cuisine. I really do love to eat in Mexico and my excitement about the food is only rivaled by my excitement about eating Indian food in India. So, I absolutely could not wait to eat at some of my favorite restaurants, to dig into some of my favorite dishes and to pay a visit to some of my favorite food markets during my travels to Mexico this time around. It should also come as no surprise that, by the time the trip was over, I left Mexico more than satisfied, as usual, with the diverse culinary experiences I had throughout my stay. So what did I eat exactly? What are my favorite Mexican dishes? Those are my favorite dishes. And now I want to eat Mexican food. But I won’t because I know that I’ll most likely end up quite disappointed. 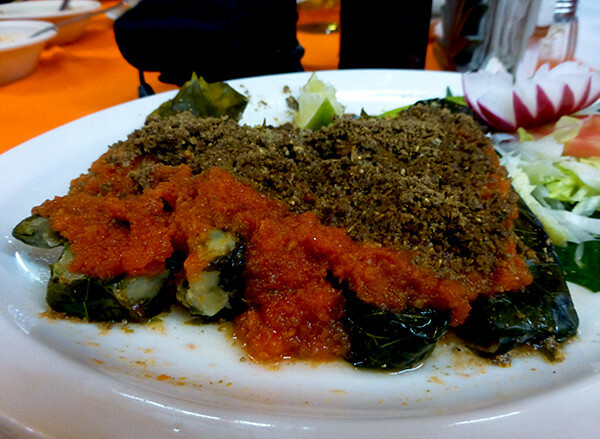 The fact is, like with other foods, no matter where you may live, you just can’t find a tlayuda, mole colorado, sopa azteca, enchiladas or alambre that will even come close to what is served at a local joint in towns and cities across Mexico. Are you as big a fan of Mexican food as I am? Any other favorite dishes? Well, now I’m craving some Mexican food. Taco taco burrito burrito!! One of the MAIN reasons I travel is for the food. Ok, it’s not the only reason, but food plays a huge role in learning and enjoying the culture of a new country. So many places I have been, food plays a huge part of my enjoyment. In India and Italy, food/eating means love. My mother-in-law happily ran after my daughter in India with a hand full of roti and goat curry encouraging her to eat. And when my kids ate her chicken biryani it made her the happiest grandma alive. I really don’t think you can enjoy travel if you are a fussy eater. Actually most fussy eaters I know do not enjoy traveling, for fear of the food unknown. Sushi in Japan, kimchi and bibimbap in Korea, pad Thai in Thailand, puri and chole in India, escargot in France, Beijing duck pancakes in China and I can go on. Nothing tastes as good as eating authentic food in the actual country it comes from. I have never been to a restaurant in any country that can properly replicate another countries cuisine. Maybe that is because part of the food enjoyment is having it made and eaten in the country it was invented. No matter how many samosa’s I’ve eaten and continue to eat, none taste as good as the samosa I ate on the street corner of Mumbai, in the killer humid heat, outside a beautiful temple. Was that Samosa better than any other I’ve eaten, no probably not. But the memory of eating it, is what I remember. Hey Ashley – Even today you could easily travel around Mexico for $800 USD per month. That wouldn’t be difficult at all. Those all look so good! 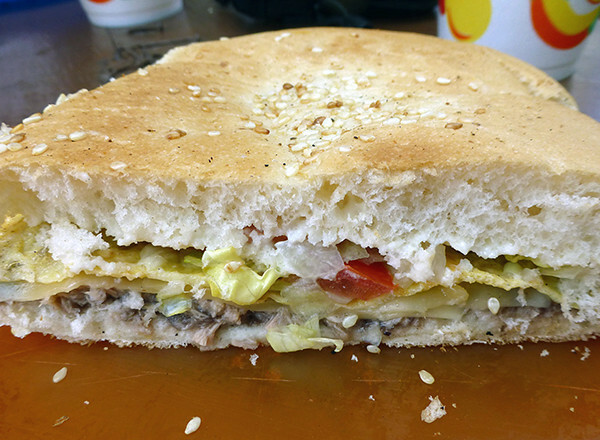 Especially the alambres de pollo and tortas grandes. Now I’m hungry! I haven’t done much travelling, but I went to Spain once and absolutely loved the food. My school has an international night and I had three plates that were completely full! But nothing beats the authentic stuff. Hope I can go to Mexico one day! Im hungry from reading this post! We spent a month in Mexico recently and Ive been telling everyone its the best food Ive ever eaten! So much flavor! I would go back just for the food itself – Lucky everything else about that country is awesome too! Everything looks delicious! I would love to try them all! I’ve never had real Mexican food in Mexico, but I’ve had some fairly authentic stuff in the US, plus the standard (but tasty) Tex-Mex stuff. It is probably my favorite cuisine, and now that I’m living in Germany, I miss it so much. Your pictures look amazing! Germans just don’t do spicy (except currywurst) and often the things they label as a burrito or tacos aren’t even right. If I want decent salsa, I make it myself. This is the kind of stuff that makes me homesick! Hey Ali – I’ve found in general that Mexican food in Europe is not the greatest but it sort of makes sense as they just don’t have the concentration of Mexicans or the proximity to Mexico that the US has. I’d recommend to visit Guadalajara. The foot over there is much more tastier than in any other place in mexico. Nothing to do with the usual international Mexican food stuff. We finally get to Mexico for the first time later this year and I am so excited to eat EVERYTHING. Hey Lauren – Ha…you have no idea the treat you are in for! There is a Mexican restaurant here in China so I often dine out there but I bet the authentic Mexican food you had is so much better. I love crispy tortillas and veggies so I would definitely go for Vegetarian Tlayuda ;-)))) Can’t wait for my culinary journey around Mexico !! Ahhhhh. You make me want to run down to Mexico right now! I too love Mexican food and you’ve certainly featured some of my favorites! Hey Mimi – Meet you there? Now this is I’m talking about! Great post, and very mouthwatering. Truly one of the greatest cuisines in the world. My mouth is seriously watering just looking at your pictures. Food is by far one of my favorite aspects of traveling as well. My boyfriend always makes fun of me because we come home from different trips and I can’t stop talking about all the great food. I have to admit thought that I have always been a little nervous about the food in Mexico. Glad to see you enjoyed it! Cheers. Hey Allison – Mexico has that stigma attached about eating the food…but in reality, the overwhelming majority of restaurants, including very local ones, are clean and perfectly fine to eat at. I don’t think I’ve ever gotten sick from eating in Mexico and I’ve spent over 2 years there…and I eat very local! I just ran across this blog, and I must say that I am thoroughly impressed that you’ve been able to turn travel into a way of life. We’re serial expats, but not serial wanderers, and for all of the adventures we’ve had, there is still something different about a life on the road. Congratulations, dude. 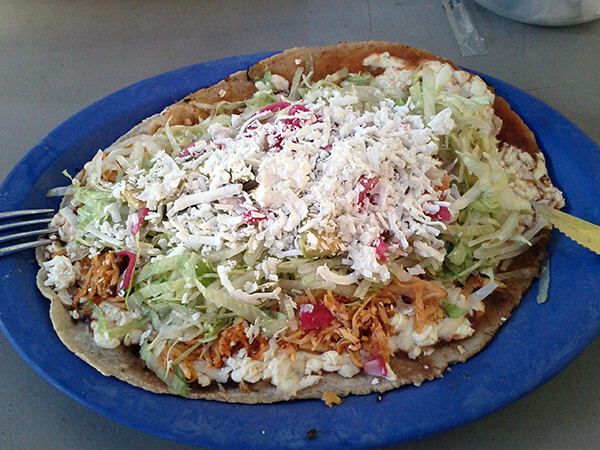 I love tlayudas (I followed that gorgeous photo over from Pinterest), mole, and huaraches, but sopes are my favorite! Thick but soft and a little crispy, if made just right. Great post, Mexico is one of my favorite countries for great food. 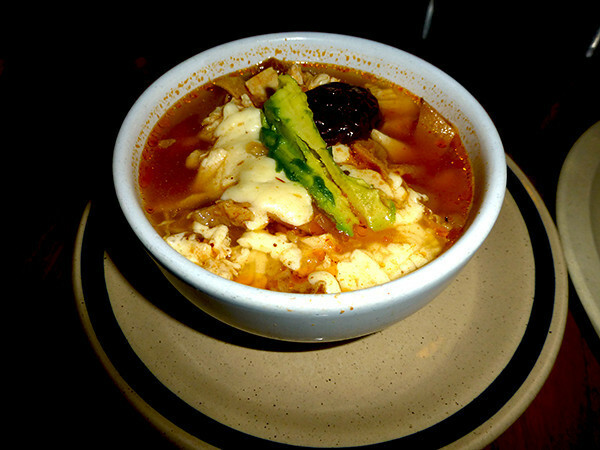 Hey Cassie – Sopes are great as well, as are panuchos! I love how they can take a few ingredients and turn them into 429 different dishes! I’m really curious about the mole. Apparently it’s prepared with chicken? Might give that a go! 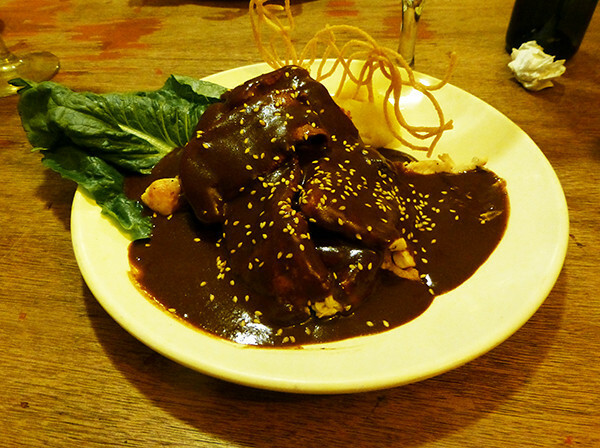 Hey Sofie – Usually you would eat the mole with chicken. 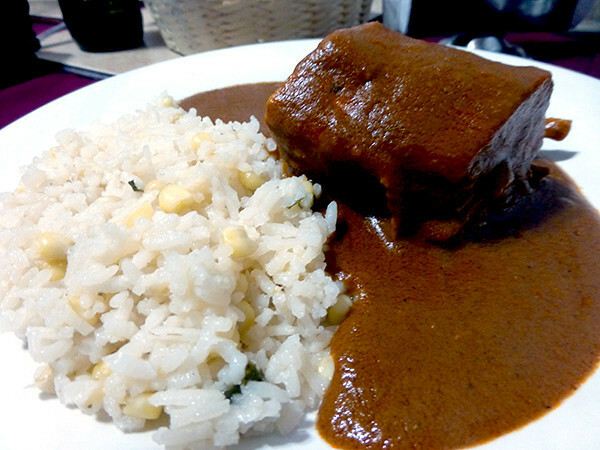 Most of the time it was a big piece of chicken smothered in the mole sauce…so good! I wasn’t a big fan of Mexican cuisine, I’m going to sound insane but I’m not a huge cheese fan and I don’t usually have beef often in the week. Although Mexican cheese is quite lovely, I was having issues consuming it on a daily basis (yes, I’m crazy to most people for saying that). The second last meal I had on my trip, a friend who was ordering uttered the words sin queso on my behalf and I honestly thought the kid was going to faint. He looked like he’d been shot and not sure how to react… I felt like I had injured this boy’s pride, but I couldn’t help but burst out laughing at the time. The quality of fruits and vegetables is absolutely beautiful, the soup is divine – especially their lime soup and their carrot, I enjoyed the mole very much and I agree, they make wicked sandwiches in Mexico!! This is probably not classified as a meal but their ice cream is pretty lovely too. We are yet to go to Mexico so I suppose I have never really tasted the authentic Mexican cuisine which makes it more exciting! Drooling like a rabid raccoon here. Just announced to my wife that we’re going out to Senor Tequila’s in Naples, Florida, for dinner. Mexican is my favorite! Pretty much everything you’ve shown here is stuff I’d eat without hesitation. I also love tamales of any kind. All of that food looks amazing. Especially the torta and mole. Love them both. For me it’s tied with Italian as the best cuisine in the world! Chile rellenos. I will try them at any restaurant that I haven’t yet eaten them at. The best I’ve had were in New Mexico so I can’t imagine how tasty they must be in regular Mexico! Chilaquiles are another favorite…my grandmother is Mexican so I’ve got many fond memories of the food she would cook at her house. Couldn’t agree with you more about the delicious food in Yucatan, its incredible how different it is compared to other parts of Mexico, and especially the Mexican food I’ve grown accustomed to eating from growing up in California. 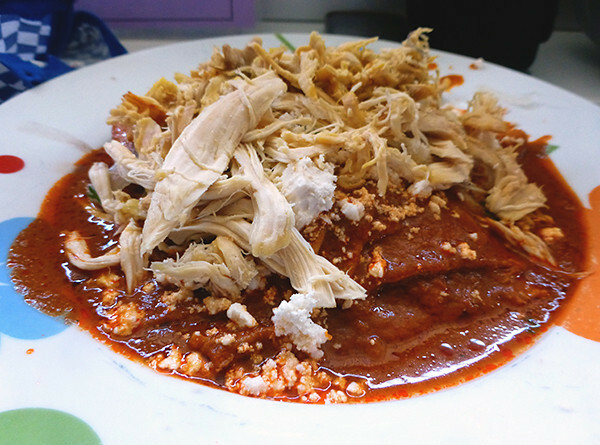 If your ever in Los Angeles, theres a small restaurant near downtown called Chichenitza that serves food unique to the Yucatan Penninsula (Pollo Pibil, Poc chuc, etc. 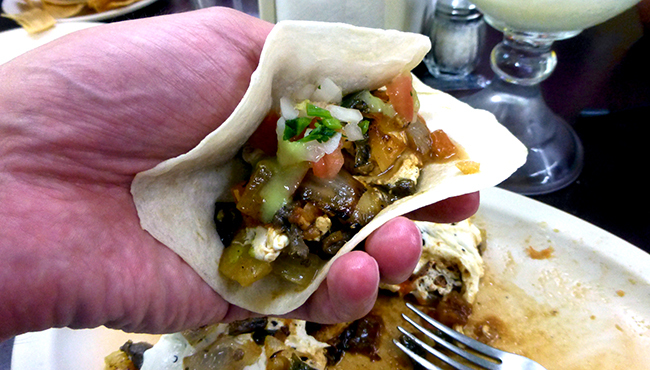 ), its the most authentic I’ve had outside of Yucatan. Check it out! Much respect. Not sure they have them in Mexico but in Panama the serve “churros injected with dulce de leche right out of the ol deep fryer. Nail on the head Earl, Mexican food has been my greatest joy and my arch nemesis. I was hoping to lose a few dozen pounds here in Playa del Carmen. Suffice to say that hasn’t really worked out. 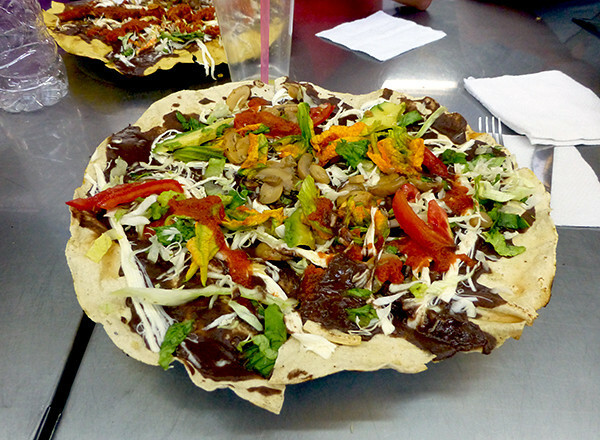 My thing at the moment is Tostadas, man do I love a big messy Tostada! It looks amazing! Now I’m hungry. 🙁 I’d like to try the sopa azteca the most, although the squash blossoms are intriguing. Ohhh it all looks so delicious! My favourite is still Quesadilla with mushroom. Never had the Dzoto Bichay.. Next time! Looks good, reminds me I have to make dinner ;). But where is the fish? They have such nice dishes with fish and shrimps. Did you try coctel de camarones y pulpo? One of my favorites! earl! this post definitely makes me hungry! you are very right. mexican food is delicious. it seems like we always can adapt so easily to eating new foods when we are in different countries. i love all food.. so definitely would enjoy some delicious mexican food right now. having spent almost four years there.. i would say that i absolutely enjoy korean food more than any other food on this planet. korean food will always be #1 in my belly! i would certainly recommend authentic korean food as quite amazing! This literally makes me want to cry tears of jealousy. Just spent the last three months in India (and I agree, the food is WONDERFUL) and now I’m in Nepal. What I wouldn’t do for some Mexican food… whhhaaaaa. OMG I WANT IT ALL IN MY FACE RIGHT NOW! Reading this right before lunch time was a bad idea. Mmmm. Looks so good. You’re really whetting my appetite for Mexico, Earl! Nom nom nom. I’m also a huge fan of tlayudas. For some reason, I never see them in Mexican restaurants in the US. In Oaxaca, I’d recommend going to the central plaza and just getting tlayudas on the street.